How many scientists question evolution? Scientific journals now document many scientific problems and criticisms of evolutionary theory. ... Many of the scientific criticisms of which I speak are well known by scientists in various disciplines, including the disciplines of chemistry and biochemistry, in which I have done my work. ... None of the great discoveries in biology and medicine over the past century depended on guidance from Darwinian evolution -- it provided no support. ... In my judgment, this state of affairs has persisted mainly because too many scientists were afraid to challenge what had become a philosophical orthodoxy among their colleagues. Fortunately, that is changing as many scientists are now beginning to examine the evidence for neo-Darwinism more openly and critically in scientific journals. As of April 2012, this list had 840 names. So what are the facts here? Is evolution truly a "theory in crisis," as creationist author Michael Denton once described it [Denton1986]? Is there a tidal wave of defections from the "orthodoxy" of evolution? First of all, it should be noted that the Discovery Institute statement above does not question several of the widely accepted high-level tenets of evolutionary theory, such as the fact that the Earth is very old, the fact that living organisms have a common ancestry, and that at least some natural evolution has occurred. The only issue mentioned in this statement is the question of whether mutations and natural selection are sufficient to account for the complexity of present-day life. In other words, those looking to this list to support a young-earth creationist worldview will be sorely disappointed -- few, if any of the signers of the Dissent statement support young-earth creationism. 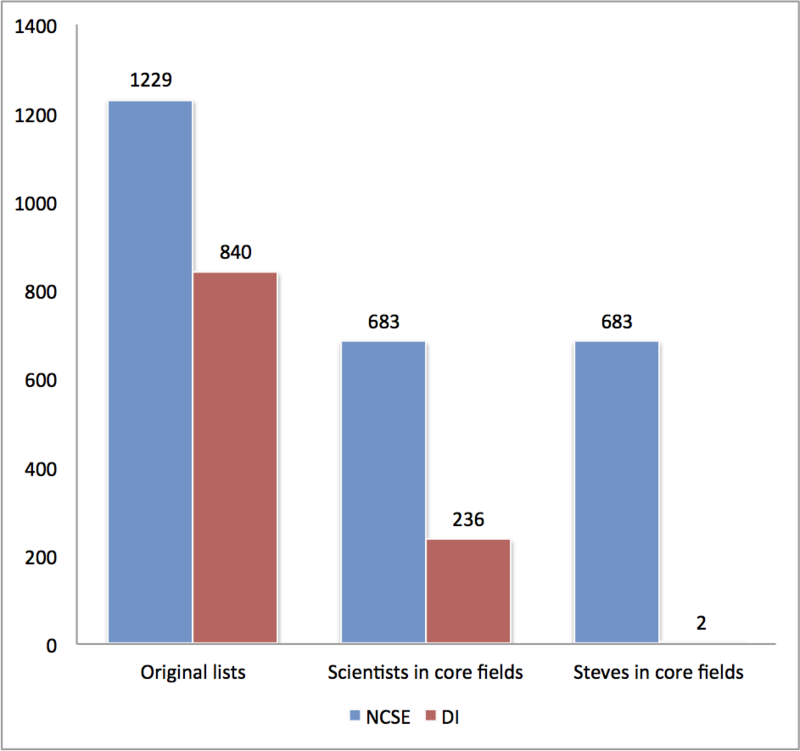 As of October 2012, the NCSE list had 1229 names, compared with 840 on the Discovery Institute list. If we count only those persons on these two lists who had a Ph.D. degree and/or professional position in a core field closely related to evolution (Anatomy, Anthropology, Bacteriology, Biochemistry, Biology, Biophysics, Botany, Ecology, Entomology, Epidemiology, Genetics, Geology, Geophysics, Molecular Biology, Microbiology, Neurophysiology, Paleontology, Physiology, Taxonomy, Virology or Zoology), who thus are particularly well-qualified to make such a declaration, then 683 (55.6%) of the names on the NCSE list were so qualified, compared with only 236 (28.1%) of the Discovery Institute list, according to a detailed check performed by the present author. If we then further limit the Discovery Institute core field list to those persons named Steve or one of the variants above, so that the size of this list can be directly compared with the NCSE core field list, then only two signers remain (in general agreement with the fact that persons named Steve or one of the above variants constitute roughly 1% of the U.S. population). This data is shown on the chart below. Note that in the right-most set of columns, the DI column (corresponding to two persons) is invisibly small compared with the NCSE column. We mention in passing that in uniformly applying the "core field" filter to each list, it was necessary to exclude Cambridge Professor Stephen Hawking and Nobel Laureates Steven Weinberg and Steven Chu from the NCSE list, because, strictly speaking, their field of study (physics, in each case) was not among the core fields specified above. No persons of remotely comparable qualifications were excluded from the Discovery Institute list when applying this filter. In short, no matter how one objectively compares these lists, it is a fair conclusion that several hundred times as many well-qualified professional scientists accept the main precepts of evolution as dissent from them. And, given that the number of signers of the Discovery Institute list has hardly grown at all in the past two or three years, there is no indication that the number of dissenting scientists is sharply growing relative to those who have declared their support of evolution. The above results are entirely consistent with a 2015 study by the Pew Research Center [Rainie2015]. The study surveyed members of the American Association for the Advancement of Science (AAAS), arguably one of the most prestigious professional organizations of research scientists. The study divided the participants into three categories: (a) currently working PhD scientists; (b) active research scientists who have received at least one research grant within the past five years; and (c) domain experts, whose specialty area is particularly relevant to the policy issue in question. Their views were compared with the general public. When asked whether "humans have evolved over time," 98% of all AAAS members said yes, and 99% of working PhD scientists and 99% of active research scientists all said yes. This contrasts with only 65% of U.S. adults in the larger public sample [Rainie2015]. The overwhelming majority of biologists accept evolution. Those who know professionally the evidence for evolution cannot deny it. Scientists agree that the evolutionary origin of animals and plants is a scientific conclusion beyond reasonable doubt. The evidence is compelling and all-encompassing because it comes from all biological disciplines including those that did not exist in Darwin's time. In the second half of the nineteenth century, Darwin and other biologists obtained convincing evidence from a variety of disciplines, which had reached early maturity during the nineteenth century: anatomy, embryology, biogeography, geology, and paleontology. Since Darwin's time, the evidence for evolution has become much stronger and more comprehensive, coming not only from traditional sources but also from recent disciplines such as genetics, biochemistry, ecology, ethology, neurobiology, and molecular biology. ... Because the evidence is so overwhelming, ... evidence for evolution no longer engages the interest of biologists except when explaining evolution to the public or arguing with those who refuse to accept evolution. Although not sought and no longer needed, the evidence for the fact of evolution continues to accumulate.